1. Preheat the oven to 150°C, gas mark 2. 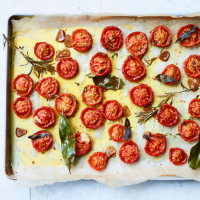 Pour the oil into a baking tray, large enough to fit the tomatoes in a single layer with room to spare (if they fit too snugly they will steam). Add the sliced garlic and herbs. Coat the tomatoes in the oil, arranging them cut-side up, and roast for 2 hours. By this time, they should be soft, sweet and concentrated in flavour. 2. The tomatoes can now be cooled, then drained to be used as an antipasto, served on toast with mozzarella and balsamic vinegar. Use the flavoured oil to make dressings, or remove the herb stalks and mash the tomatoes into the oil with a fork to create a rich sauce for pasta, chicken or fish.